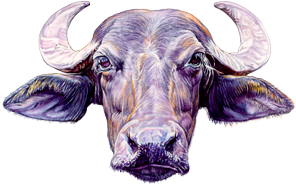 Water Buffalo Milk is traditionally used to make the delicacy Water Buffalo Mozzarella. We wanted to make a Greek Yogurt without straining and mechanically processing the yogurt. Because Water Buffalo milk it is higher in protein and lower in saturated fat than cow's milk, it was a natural choice for making a thick Greek yogurt without having to strain the yogurt. Water buffalo are harder to milk than cows but we don't mind. All good things require patience. Did you know we have water buffalo in our herd than are over 10 years old! Fortunately, these buffs aren't even in their prime as Water Buffalo can continue to milk into their 20s. In Asia, Water buffalo are not only used for milk production but are used as draft animals and also used for transportation. Our hats are off to the young folks across the globe, check out Matt's successful and unsuccessful attempts at riding a couple of our ladies.